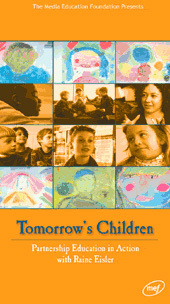 Tomorrow's Children: Partnership Education in Action. Do politically expedient proposals for more testing prepare children for the challenges of the 21st century? What is the role of schools in a time when the mass media are children’s most frequent teachers? In Tomorrow's Children, based on her groundbreaking book of the same name, Riane Eisler offers a practical blueprint for transforming how we educate our children and ourselves.